We’ve been living on the road in our RV for over 11 years now. I know the reality of this lifestyle now. One big misconception that I had was that life on the road would be an active life. We would be hiking, biking and kayaking everywhere we went. We would also be eating all sorts of fresh foods from farmers markets. We were leaving our friends and weekly parties behind. We would be fit and healthy as a natural byproduct of our RVing lifestyle. If anything, life on the road can be even more sedentary and unhealthy than life in a stick and brick home. We’re still working so we sit at our computers a lot. When we’re moving it’s in a vehicle sitting in comfy seats. At least in a stationary house, you can find a preferred walking route and do it every day. On the road, you never know exactly where you are or what is around. Yes, there are ways to find out with Maps and other online resources, but you need to do that every time you move. And, don’t think that you’ll be without your friends and won’t do any partying! We meet more friends on the road than we ever had staying put, and the basic unit of camaraderie is Happy Hour! You have to make a conscious effort to eat right and stay fit while living in an RV just like living in a house. We find that an app called MyFitnessPal can help. Fill in a few goals – like number of calories per day, and amount of weight to lose over time, and MyFitnessPal will help you stay on track. You do need to make the effort to write down what you eat, but MyFitnessPal makes it relatively easy. You can search for a food in its database. It even has things like Publix Cobb Salad, or TGIFridays Baby Back Ribs in the database. And, as you enter your normal foods, it’s really easy to select them from your “My Frequent Foods” list. You can also create “Recipes” so the next time you have your famous Chicken Cacciatore, you don’t have to figure out the calories. Very easy to add foods and track your daily calorie intake, including scanning barcodes for packaged foods. On my Android phone, I put a widget for MyFitnessPal right on my opening screen. It’s in my face with information on how many calories I’ve consumed so far, and a single tap to bring up the barcode scanner to add something new. 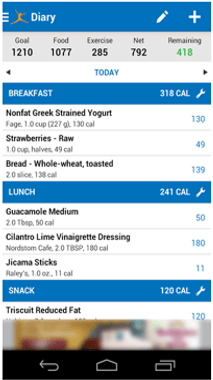 MyFitnessPal is an App on your smartphone or tablet. It works on Apple, Android, and Windows devices as well as being a website you can access from your computer. Regardless of what device you’re using, once you’re logged in, all your information is there. Add a friend to your information and set it to share your food diary so this friend can help you stay on track. We also just got the Taylor Bluetooth Body Fat Smart Scale w/ SmarTrack App . With this scale, whenever we weigh ourselves, that results is sent to the phone and recorded in MyFitnessPal. Now, if we gain or lose, we can look at the food log and see exactly what works … or doesn’t. Now, what’s our excuse? It also can connect to other apps like Runkeeper or your Fitbit, and it will subtract calories used for exercise from the calorie intake of food. Platforms: Android, iOS, Windows, and browsers. We demonstrated MyFitnessPal in the App of the Week segment of What Does This Button Do? Episode 38. The whole show is about 40 minutes, but the segment on MyFitnessPal is only a few minutes and it starts at 32minutes and 30 seconds on the timeline. Check it out. Published by MrsGeek, in Blog. Tagged with #GeeksWhoTeach, Android, Apps for Travelers, Droid, Fitbit, iPad, iPhone, myfitnesspal, Runkeeper, RV Lifestyle, Smartphones, SmarTrack App, Taylor Bluetooth Body Fat Smart Scale w/ SmarTrack App, Tutorial Video. I am actively using the MyFitnessPro app with my FitBit Flex. I had previously used the MyFitnessPro.com DIARY app in 2013-14 but had gotten away from it and my weight went back up. I bought a FitBit Flex last Christmas and wear it 24/7 except for showering. I am a Diabetic and I am now working with two Health Educators/Coaches to get my eating back under control. They do telephone check-in appointments and I have previously read them my blood pressure & blood sugar “numbers” over the phone or emailed them scanned hand-written:eating logs or Excel PDF files prior to the calls. Tonight I am going to look at REPORTS that are a feature of my new PREMIUM membership. It is all about honest reporting and the database is amazing. I just created my own recipe and learning how to calculate the various nutritional values. I should have said MyFitnessPAL, (not Pro). And I sync with my FitBit Flex to merge me credit for calories burned with counted steps to my Diary calories allotment. I successfully produced multiple weeks worth of daily reports, merged them into a single Word File, saved as a PDF document that I then emailed to my Kaiser nutrition & health educators. Boy, were they impressed with the reports, not just my readings!! !